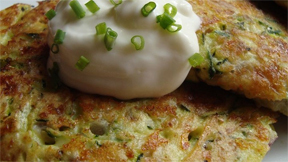 In a medium bowl, combine the zucchini, eggs, onion, flour, Parmesan cheese, mozzarella cheese, and salt. Stir well enough to distribute ingredients evenly. Heat a small amount of oil in a skillet over medium-high heat. Drop zucchini mixture by heaping tablespoonfuls, and cook for a few minutes on each side until golden.